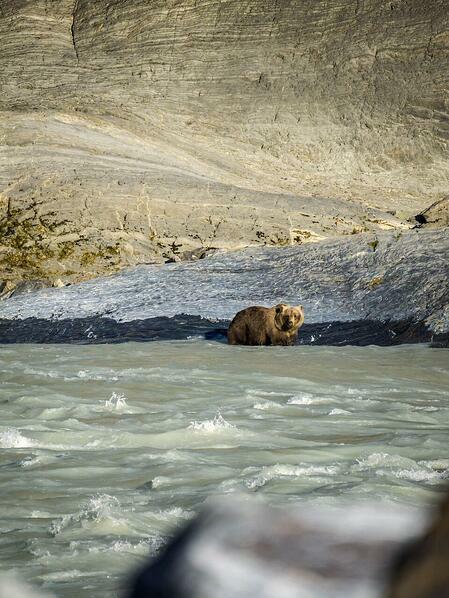 We’re on the most special river in the world to me—the Alsek River. It’s day five of our twelve-day trip, and we’re only one day away from Turnback Canyon. The possibility of paddling through the canyon is becoming a real option. We received some information on our In-Reach that the river is at an unpredicted medium-low flow of 450 cms. This means that it is not only within a runnable range; it is probably runnable for me. I was not prepared for this. The nerves and excitement around our campfire grow. 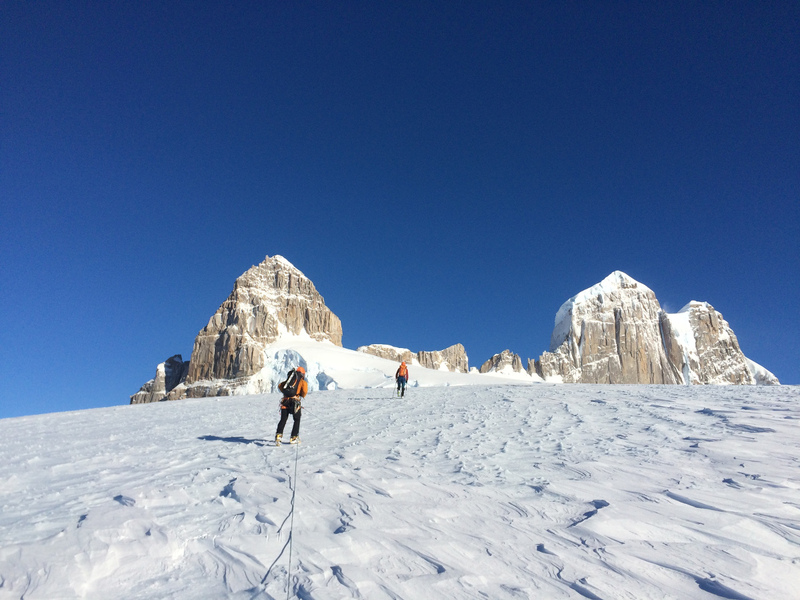 Each expedition member is now considering whether their path down Turnback will be six kilometers of continuous, boily, exploratory Class V whitewater, or a six-kilometer hike across the terminal moraine of a glacier while carrying a hundred-pound creekboat. Both options seem like fairly significant feats. Tonight, I have left the fire and walked up to a rocky shelf to have a moment with my own thoughts. I can feel the weight of this decision. In the face of the orange and grey ridgeline of Bates Creek towering above me and icefall that clings to its shoulders, I do not feel humbled or insignificant; I feel powerful. 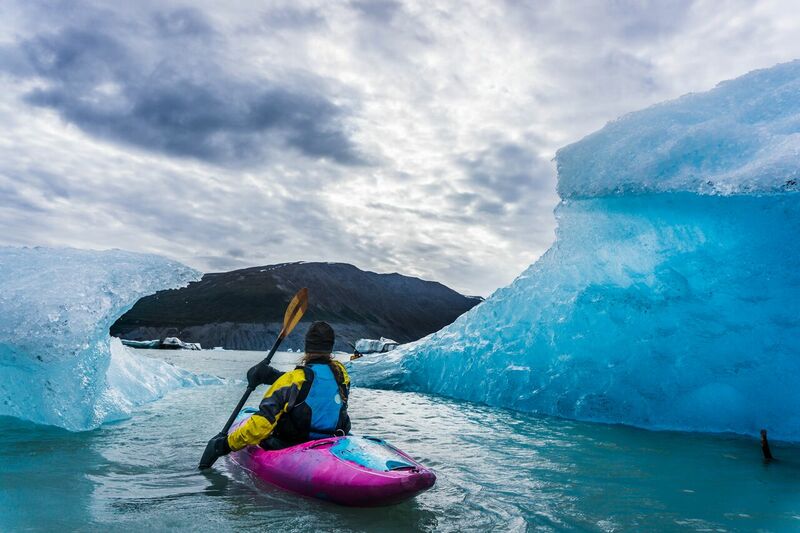 The impressive skylines, remote whitewater and wild weather of the Alsek expect the most of anyone who passes through these valleys. That is why I love this place. As I head back down to camp, a ball of nerves settles into the pit of my stomach. Deep down, I know there’s no way I can walk past Turnback without having a good scout and a crack at the canyon, and I am scared. 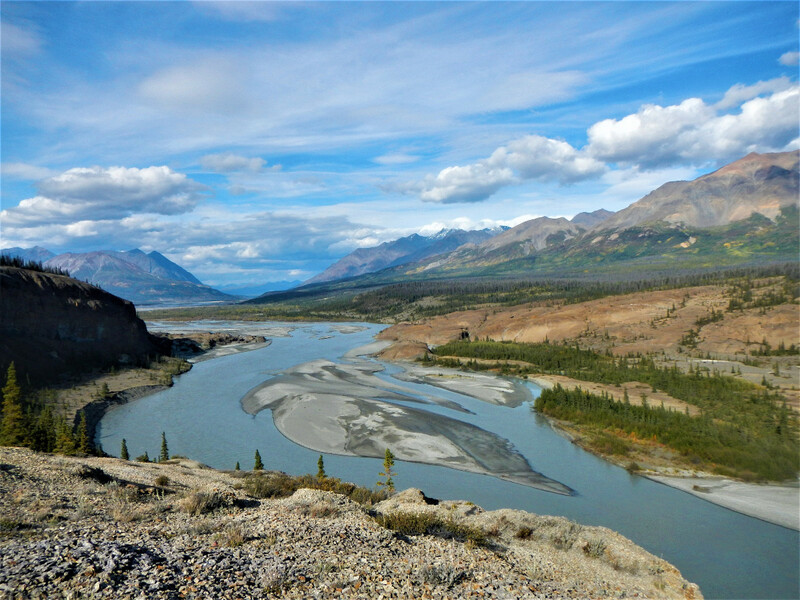 Our crew of six left from Haines Junction to paddle 300 kilometres down the Dezeadeash River and into the Alsek River towards Dry Bay, Alaska. Every piece of food and gear that we would need for the next twelve days was packed into our whitewater kayaks. We were a motley crew of paddlers: Adam, Chad, and Gordie are from California; Terral is from Revelstoke, British Columbia; Bryce is from Canmore, Alberta; and I’m from Whitehorse, Yukon. 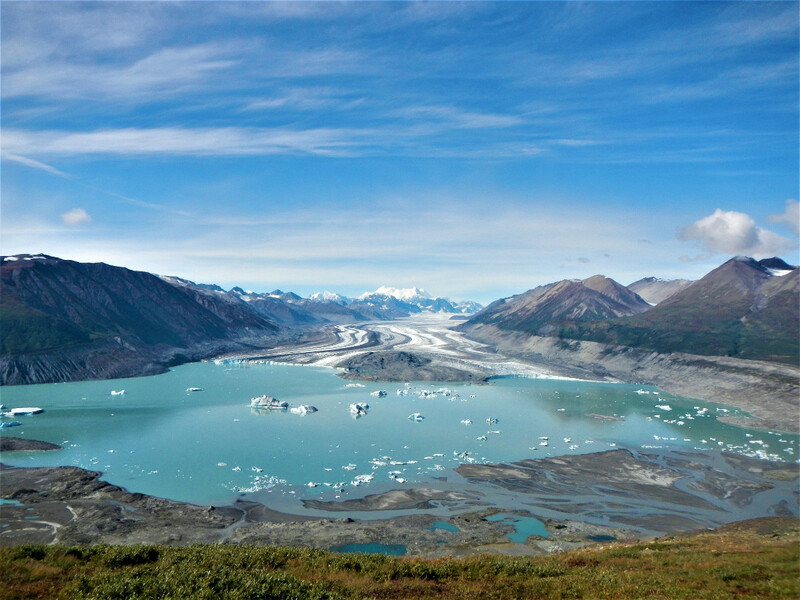 I have guided a handful of raft trips on the Upper Alsek and the Tatshenshini-Alsek Rivers, but have never paddled the full Alsek. For most, Turnback Canyon warrants a helicopter portage of rafts—or a crew of kayakers ambitious enough to commit to either paddle or portage. It has of course been paddled since, but usually only by a few people every few years. 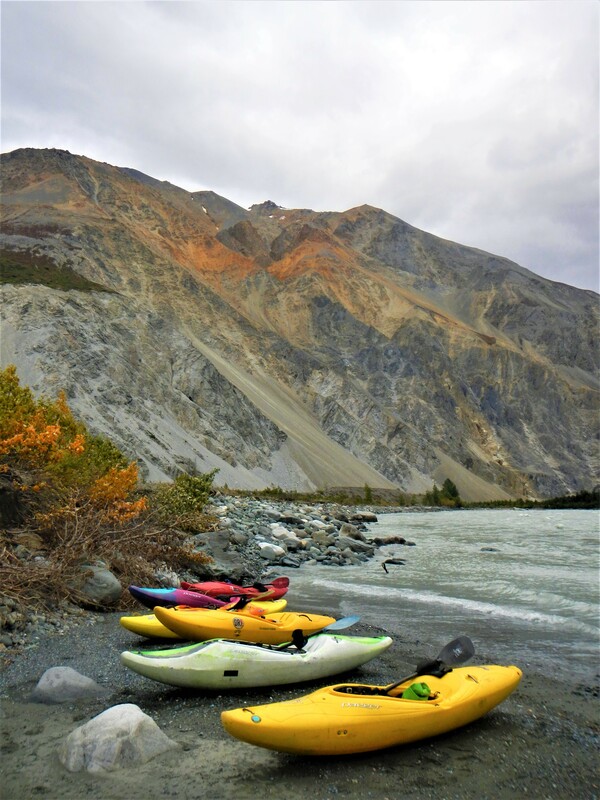 Kayakers who portage the canyon describe it as 6 to 13 hours of heinous trudging through an icy Mordor at the toe of Tweedsmuir Glacier. On the trip so far we have been incredibly lucky with our weather and scenery. 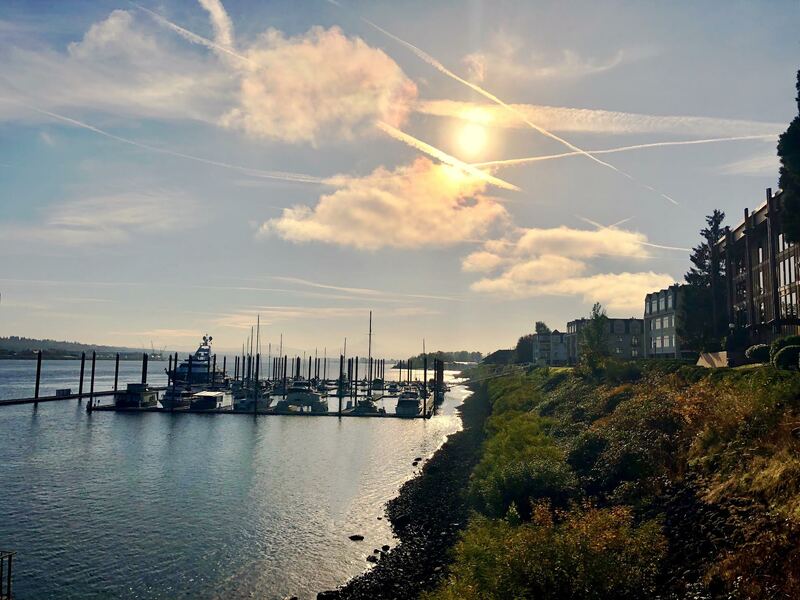 Although we expected sideways sleet in September, we have had sunny, warm autumn days and crisp evenings. 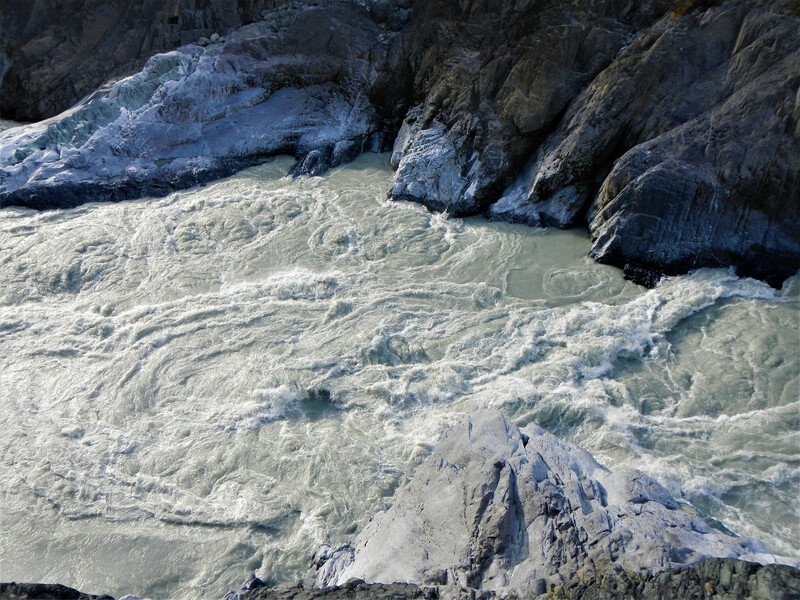 We paddled two fun Class IV rapids on the upper section: Sam’s Rapid and Lava North. We stayed up late to watch the northern lights over Lowell Lake. We caught the last of the summer wildflowers and a glimpse of the mountain goats that gave Goatherd Mountain its name. And now, we find ourselves inching closer to the crux of our adventure. When I wake up at camp upstream of Turnback Canyon, the ball of nerves is still in my stomach, but I’m starting to feel anticipation and wonder as well. Four of us, Bryce, Adam, Gordie, and myself, have decided to paddle, and Chad and Terral have committed to the portage. 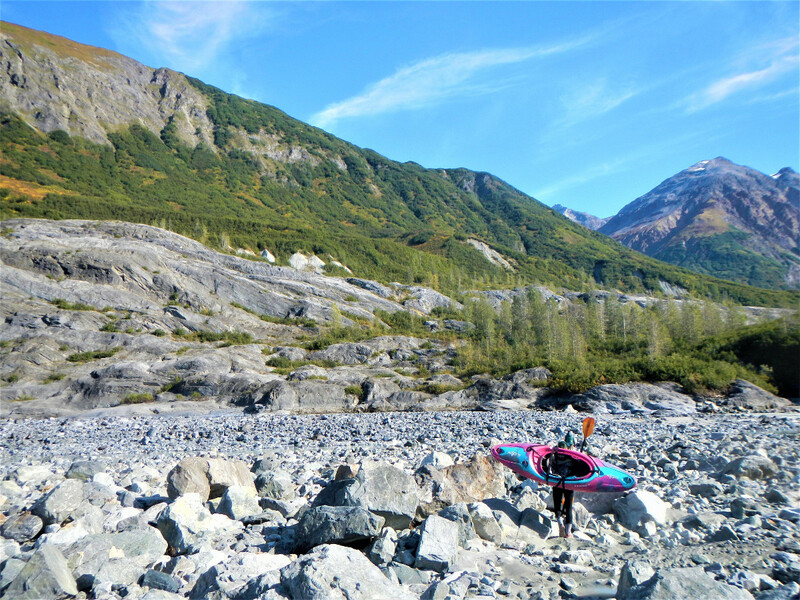 After packing our kayaks (a little more thoroughly this morning) we paddle downstream to the mouth of the canyon. I can’t wait to get a close-up look at the rapids I have heard and read so much about. At the same time, I think about how nice it would be to sip cowboy coffee and relax by the glacier back in the safety of camp. We scout the first rapid, "S-bends." I count three corners until I can’t see anymore, but the water doesn’t seem to let up. I thought an "S" only had two corners. The river is in a state of huge, erratic boils. The boils surge, pile and fold in on themselves down the middle of the river. Diagonal waves build and crash off of slightly undercut walls on the outside corners. Small eddies form on the inside corners, but these tend to rise and fall as the river surges around them. It’s intimidating, but it looks like it can be broken down into manageable pieces. I paddle out of the eddy and into the canyon, filled with that sense of thrill and the meditative calm and focus that we have all become somewhat addicted to over the years. The water is so powerful. I paddle with everything I’ve got, and the boils seem to push me wherever they want. It’s half planning and half reacting. I stay on my line without feeling close to flipping and catch our planned eddy with the other three. Gordie decides to walk out from here—two corners in, and we are down to three paddlers. The next four corners of "S-bends"are the biggest whitewater I have paddled in my life. I am a comfortable and competent Class IV (+ on a good day) paddler who found her balance of challenge and tolerable risk at this level years ago. Though I've dabbled in easy Class V, I often found the stress of it hard to manage. Turnback Canyon is solid Class V. Every paddle stroke I place has all my strength and technique behind it. I haven’t felt this strong in my boat in a while. But, on the other hand, the river folds me in a seam that puts my head underwater before I even flip over. I snap upright in possibly the fastest roll I have done in years and paddle hard. I don’t even know yet what direction I’m going, but I’m paddling. I paddle and rudder and paddle and rudder for the next few corners, surfing the diagonal waves off the canyon walls back and forth across the river to avoid the boils. We meet in the eddy and I am shaking and (oddly) giggling a bit. This doesn’t feel like low water. The brown raging creeks below the hydro-gauge could easily have added one or two hundred CMS more than expected, but we have no way of knowing. I have been nervous before but have rarely felt truly terrified on the river like I am now. We scout the next two rapids and find our GPS location in the canyon. I am feeling a bit nauseous. I discuss with my two friends what my best option is. I’m going back and forth between committing to paddling the rest of the canyon and committing to hiking out. A swim right now, even in a PFD, looks very bad—drowning bad. We don’t know how many options there are to hike out, but we know there are few. 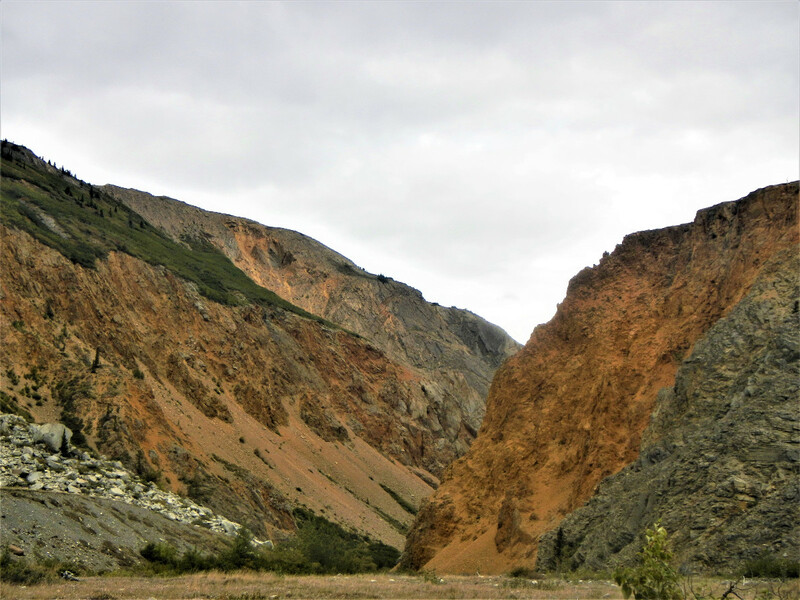 Above the next pinch rapid, "Dynaflow," I can see an exit—a scree chute extending about 150 feet up the canyon wall. If I keep paddling, I will probably be terrified for most of the day, but I am paddling well and think I can make it down. I will roll because I have to, and I already did. If I hike out, it will be a tough, long day. But I can’t stop thinking about our remoteness and the consequence of a swim in the biggest whitewater I've ever paddled. In spite of my rational brain, I am completely mesmerized with the canyon right now. I feel like this is my entire world and I want so badly to be in here and to paddle. This question repeats itself for the next seven hours as I navigate the moraine with 50 pounds of gear strapped on my back, using an aerial photo for navigation. Since I'd started the hike so late, I left my kayak at the top of the canyon wall in a thicket of alders to come back for the next day. Throughout the day I ride highs and lows. The highs come when I look out across the glacier and take in the beauty of the ice and till. 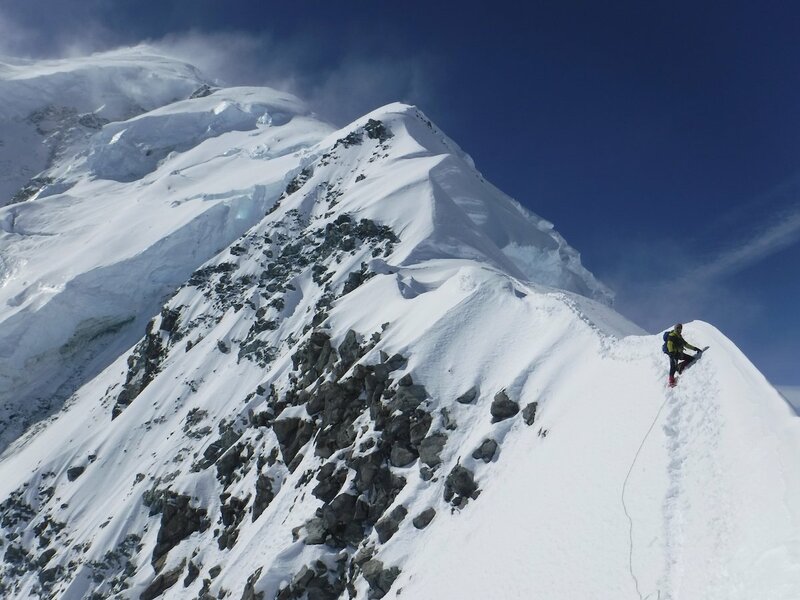 The lows come when I fall on unsteady boulders teetering on a sliding foundation of ice, doubting my exact location and not knowing much farther I have to go. I don’t know if I made the right decision, but it was a decision and here I am. When I walk into camp that night, I am met with “yahoos!” and a well-earned shot of whiskey. We have all made it safely and we are stoked. When asked how the walk was, my exact response was “if I knew how bad it was going to be, I might not have come on the trip.” I am relieved to hear that the others decided to leave their kayaks and hike back the next day, too. 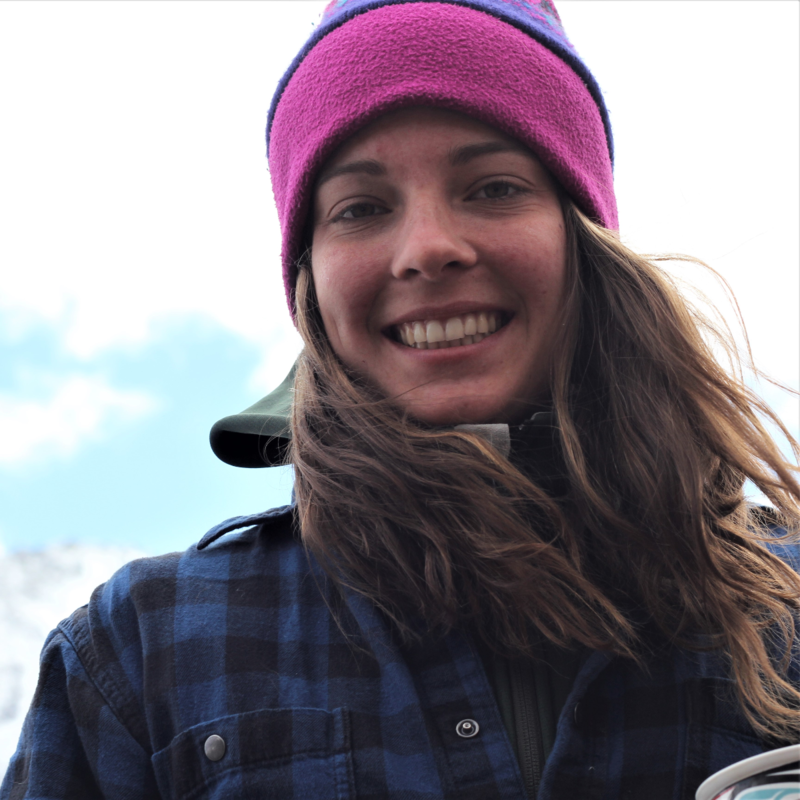 Improve your whitewater skills with NOLS. All photos courtesy of Natalie Sands.